With the help of Professional Twin Mommy, Maggie Martin, (you should totally check out her blog! ), we’ve put together a list of tips for potty training your multiples. These will be presented in a two-part installment. Potty training by itself can feel like a pretty daunting task, but how about tackling it for two, three, or maybe even more toddlers at the same time? How do you even begin? But what gives me the willies more than anything else (besides large hairy spiders) is public restrooms. Let’s all pause for a collective shudder. I don’t care if you are in the nicest place in the world, all public bathrooms are gross-gross-gross! I was like this before having a kid. But once my son was potty training, I realized that public bathrooms are in fact the stuff of nightmares. I don’t care how wonderful a parent you are, it is impossible to simultaneously handle an active toddler/preschooler, their clothes, the (filthy) fixtures, not touch anything yourself and, most importantly, shield your precious little one from what is sure to be some form of the plague. I could go on and on, but Amber Dusick of Parenting Illustrated with Crappy Pictures does a much better job describing the true horrors. Enjoy! How about you? Any funny potty training in public restroom stories to share? 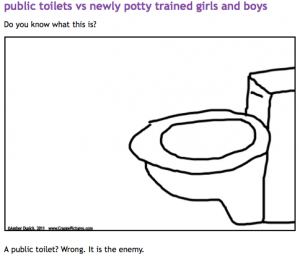 Editor’s Note: We here at Potty Time really believe potty training comes with a sense of humor. This blog link is one perspective from a parent who writes with a certain sense of humor of her own. Any opinions or choice of words do not necessarily reflect the position of Potty Time or it’s affiliates.